We are a professional, friendly, local, independently owned company and we are busy across Bristol, South Gloucestershire and the surrounding areas making transformations like the one you see below. And we would just love the opportunity to do this for you too! 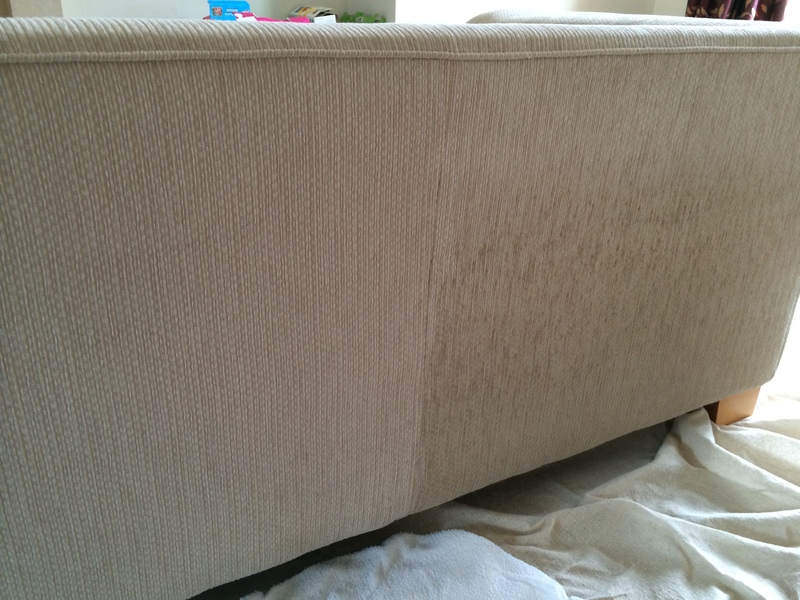 Professional Upholstery Cleaning Bristol – Doggy marks nearly gone, left side done! 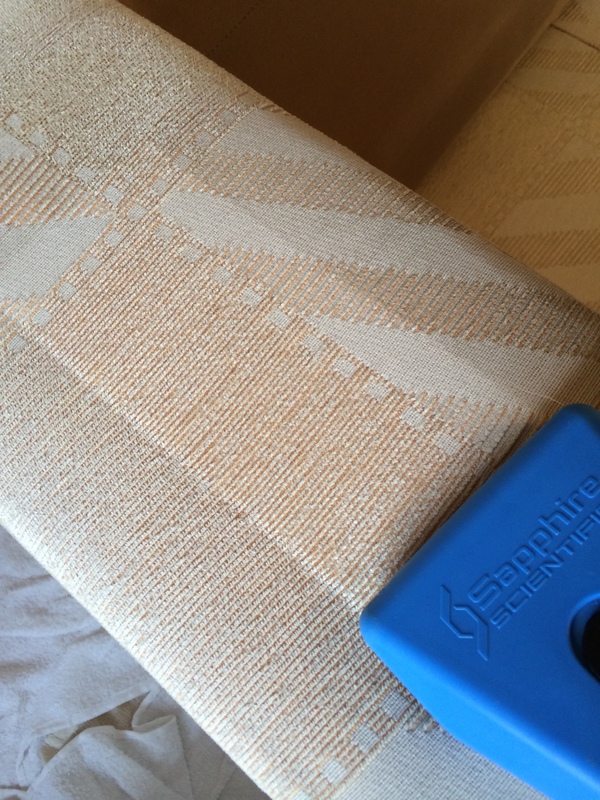 Professional Upholstery Cleaning Bristol – Sofa arm cleaning underway! We offer free no obligation quotations with no hidden costs. To book your upholstery transformation, find out more or arrange your free no obligation quotation call Karen today on 01454 436001 / 07774 908410 or get in touch using the form on our contact us page! We are passionate about customer service, for your complete peace of mind and to find out more see our service promise You can rest assured we deliver amazing cleaning results and guarantee you great local service with integrity at a fair price! Upholstery and soft furnishings such as sofas, chairs and three piece suites are expensive, regular cleaning will extend their life and is a good alternative to replacement. And you wouldn’t feel confident allowing us to clean your upholstery without knowing that we are fully trained, industry approved and regulated and of course we are! We are members of both the National Carpet Cleaners Association (NCCA) and The Approved Carpet Cleaners Alliance, both of these bodies approve and regulate Carpet and Upholstery Cleaners in the UK. We clean your upholstery using only the best equipment, procedures and cleaning agents and in full accordance with the National Carpet Cleaners Association Code of Practice. Our upholstery and soft furnishing treatments are gentle yet effective, safe for delicate fabrics and helping to prolong fabric life. After having your upholstery cleaned, we can protect it against oil-based, water-based and dry soils with stain protector. Our professional technicians are fully trained, insured and hold industry recognised qualifications in all aspects of upholstery cleaning. And of course all our upholstery cleaning services are covered by our full satisfaction guarantee, so if you are unhappy with any aspect of our work we will do it again, free of charge! To find our more about our thorough, professional upholstery cleaning Bristol and in surrounding areas, or to arrange a free no obligation quotation call Karen today on 01454 436001 / 07774 908410 or get in touch using the form on our contact us page! We provide independent, insured carpet and upholstery cleaning Bristol, Bath and South Gloucestershire. We travel to you at no extra charge and so if you are looking for high quality and safe upholstery cleaning Bristol, Bath or South Gloucestershire , please get in touch today! We are a professional, friendly, local, independently owned company and we would be delighted to be of service to you! We cover all of Bristol, Bath and South Gloucestershire including Almondsbury, Bradley Stoke, Clifton, Redland, Westbury on Trym, Winterbourne, Thornbury, Chipping Sodbury, Yate, Wotton-under-Edge, Stoke Gifford, Portishead, Clevedon, and all surrounding areas and villages.